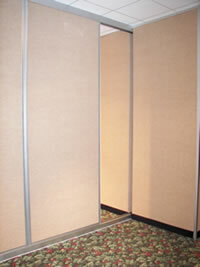 Sliding and Folding Room Dividers, Modular Walls - Panel Systems Manufacturing | Panel Systems Manufacturing, Inc. It is floor supported allowing you to install our lightweight top track even onto a suspended ceiling without requiring a beam or additional bracing. 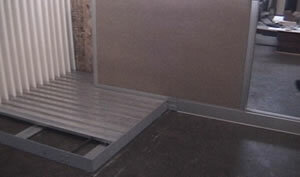 It has a 3″ wide floor track that can be removed and stored in less than 5 minutes. When you are not using the system, there is nothing on the floor. It removes all panels from your room by pushing them through a slot in the wall an onto the storage system located in a closet or an adjoining room. Read more about the operable partitions. Tracks and panel frames are manufactured from lightweight maintenance free clear anodized aluminum. Panels are manufactured in two layers that are held apart to create a 1/4″ core of dead air that reduces noise vibration through the panel. Each layer consists of a honeycomb stiffener board that is sandwiched between two pieces of 24 gauge galvanized steel. Very attractive acoustical fabric faces are laminated to the galvanized steel to help soak up the echo effect of room noise. Acoustical fabric faces are available in two stock colors of gray or brown and an additional 40 colors are available at a small up charge. 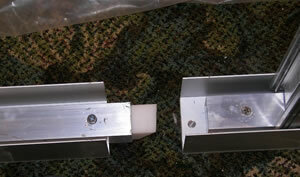 Floor tracks are positioned across the room by inserting a finger of one track into the cavity of another. Pilot pins drop down into small holes in the floor. Each 50″ wide independent panel rolls easily across the bottom track support on roller bearing wheels while being guided by the lightweight ceiling track. An odd width panel or two is usually required to round out the 50″ panels fit for the the overall room size. The panels lock into one another with rubber seals on a tongue and groove joint. The end panel seals against the wall with a wall seal channel. The top track has a deep channel that allows the panels to float up and down with over an inch of tolerance to help adjust for floor irregularities. The panels slide on and off of the different tracks on the storage system. 1/2″ thick plastic guides accepts the panels keeping them steady and upright.